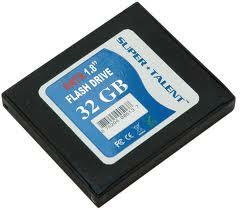 Super Talent company has come up with 1.8 inch hard disk that use NAND Flash memory as storage medium. These Solid state drives (SSDs) have lower power consumption, faster performance and are lighter, less noisy and more durable when compared to conventional hard disk drivers. This mini 1.8 inch hard disk is going to replace Hard disk in near future.Super Talent company has design these SSDs to be 100% compatible to replace Hard disk drives. Till now there are different variants in sizes and capacity from size 1.8 inch to 3.5 inch and capacity 16GB to 256GB. This product will be used mainly in Notebooks and any gadgets which are SATA compatible. Super Talent has built-in advantage such as proprietary wear levelling algorithms,a patented flash controller, and bad bit management. Super Talent are confident that this brings a great revolution in storage media market.